The Pattern Design Club is a monthly online membership where I’ll guide members through my unique Five-Stage System where you’ll explore and learn everything from creating repeating patterns to how to thrive in the pattern design industry. Members will enjoy the engagement, support and encouragement of The Pattern Design Club’s community while you make progress through my unique Five-Stage System of tutorials, supported with challenges, critiques, live Q&As, a private Facebook community and much more. When I was first learning pattern design, it was overwhelming with bits and pieces coming at me from various places. Once I started to understand the overall process myself, I realized there had to be a better way. From that experience, I developed my own unique pattern design success path that I’m calling the Five-Stage System. I’ve been teaching this system with over 350 students to date and it works! Breaking the learning process into these five key stages helps you stay encouraged, make progress and achieve results. I’m excited to share it with you and it’s included as a foundation element of The Pattern Design Club. 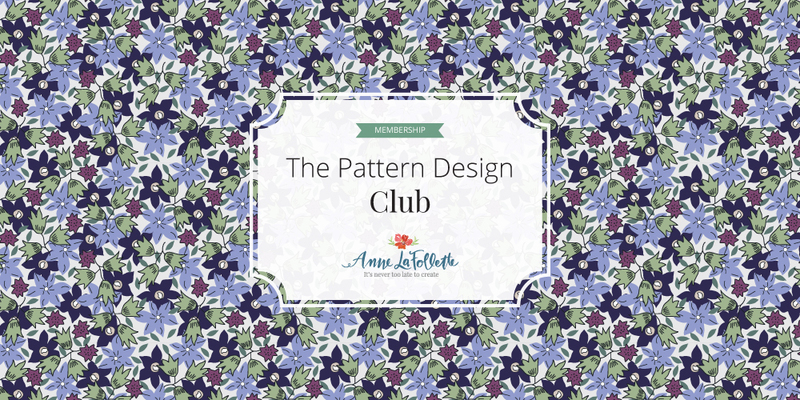 Making progress and seeing results is so very important and The Pattern Design Club is the perfect place to learn, share your successes, get support and encouragement when you need it and achieve your goals in the pattern design industry. The journey starts by gathering inspiration. You’ll explore where to find inspiration, how to capture your ideas and the benefit of creating a mood board. A mood board isn’t a completely necessary step in the process but they are a lot of fun to make. Here is an example of one I made recently that pulls together some of photographs I’ve taken of flowers and trees from around my neighborhood. Next in the design journey is sketching. You’ll put pen or pencil or paint to paper and create the foundational elements for your pattern design. This part of the process is organic and you need to allow time for creative ideas to percolate and expand. Referencing back to your mood board can help you stay focused on creating motifs that work back to your overall theme. It’s best to start simple and here is an example of five little motifs that I created last year. As we move onto the computer and inside Adobe Illustrator, you’ll import your artwork, digitize it and add color to your sketched elements. We’ll dive into how to create and save color palettes as well as coloring methods and techniques. Even though Adobe Illustrator can sometimes seem daunting, if I’ve been able to use it successfully, so can YOU! We’ll cover it step-by-step. Next you’ll embark on the actual process of creating a repeating pattern. Placement, contrast and scale will come into play. You’ll learn the three “golden rules” that are critical to creating a seamlessly repeating pattern with no errors. We’ll test your pattern as many times as necessary until you’ve got it just right. Finally, you’ll explore product options for your designs. The options are endless from fabric to home goods to wrapping paper and so much more. The most exciting thing of all is that once you have completed the five-stage process once, the pattern design journey repeats itself as we add more and more advanced techniques to each stage. If you’re excited to embark on this journey with me as your guide, mark your calendar. The Pattern Design Club opens for founding members on Monday, October 8 and closes at midnight Pacific Standard Time on Thursday, October 11. Since this is the beta launch of the membership, I’m creating a “Founding Member” tier to celebrate with special Founding Member Pricing. Founding members will keep this special membership price for as long as their membership is active. This won’t be offered again! Do you dream about making patterns? Do you see patterns everywhere around you on wallpaper, fabric, stationary, clothing? Have you tried to make patterns in the past but found yourself staring at your computer with your hair on end because Adobe Illustrator wasn’t doing what you needed it to do? Do you love to wrap gifts in different papers? Imagine how pretty gifts will look wrapped in unique wrapping papers of your own design! If you said yes to any or all of those questions, I highly encourage you to learn more about The Pattern Design Club and mark your calendar! Doors open on Monday, October 8th for FOUR DAYS ONLY! Doors close on Thursday, October 11th at midnight Pacific Standard Time here in the US. Remember, It’s Never Too Late To Create.